During the past two years that I’ve kept up this blog, I’ve been working on compilation of the first corpus of written ELF (English as a lingua franca) for Anna Mauranen’s ELFA project. I started loitering around her group shortly after the ELFA corpus of spoken academic ELF was completed, and a written corpus was already being discussed. A couple years later, with the proper mix of time, money, and research assistants, we launched the WrELFA corpus project – the Written Corpus of English as a Lingua Franca in Academic Settings. And now we can announce that the WrELFA corpus compilation is complete. Academic research blogs – this subcorpus is drawn from 40 different blogs maintained by second-language users of English and totals 372,000 words (see this and this post). PhD examiner reports – 330 evaluations by senior academics with 33 different first languages (402,000 words). I’ve discussed this data in depth in this post. SciELF corpus – a collaborative, stand-alone corpus of 150 unedited research papers by academics from 10 first-language backgrounds. Partners from 12 universities contributed texts to the 759,000 total words (see this post). Registration is open for an intensive, three-week course entitled “English as a lingua franca – a new language?” (5 ECTS) offered from August 4-20, 2015, through Helsinki Summer School. The University of Helsinki’s annual summer school brings in students from around the world, and we look forward to welcoming a diverse group to join in our research into English as a lingua franca (ELF). Professor and university Vice-Rector Anna Mauranen is a trailblazing expert in ELF research, and her ELFA project leads the way in the study of academic ELF. What makes this course different? First of all, it will be hands-on and data-centered. One of the advantages of studying in Helsinki is our wealth of linguistic databases. In addition to the spoken ELFA corpus (1 million words), we recently completed the first written ELF corpus, WrELFA (1.5 million words). Each teaching day will begin with a lecture, followed by a language lab in which students will get to work with ELF data, applying and exploring the concepts in practice. Secondly, our course is linguistically oriented. If you’ve read about ELF research before, you might have the idea that this is an ideologically driven field, especially toward reforming the status quo in English language teaching. In Prof. Mauranen’s group, however, we tend to focus on the descriptive challenges of ELF and how it should be understood in relation to English(es) as a whole. Is ELF a new language? Or is it just English? The summer course will mainly be taught by two ELFA project researchers, Svetlana Vetchinnikova and Ray Carey (that’s me). We base the course on Mauranen’s three-level framework for understanding ELF: the macrosocial, microsocial, and cognitive levels. This framework is also the basis of her book, Exploring ELF: Academic English shaped by non-native speakers (2012, CUP), and Prof. Mauranen will provide a lecture introducing these perspectives at the beginning of the course. With English serving as a global lingua franca, it’s easy to see the ill fit when a minority of English speakers (those who speak it by accident of birth) exercise disproportionate control over what should be regarded as acceptable English. In scientific publishing, for example, authors using English as a lingua franca (ELF) encounter linguistic gatekeepers who not infrequently insist on “native-like” English as a criteria for publishing. Yet, attitudes are changing just as quickly as anything else in our single-click world. Even native speakers of English can see that we need to be cool about English. In an article this month in Slate, Boer Deng, herself a second-language user of English, has an interesting take on English as the scientific lingua franca. She argues that the English supremacy in academia is linked to American spending on and production of PhDs, which has exploded since the 1960s. She further points out the added challenges of representing one’s self as a professional without the advantage of using your first language. As a result, native speakers of English should show more understanding and consideration toward their peers – in short, we need to be cool. ELF7 Doctoral workshop. 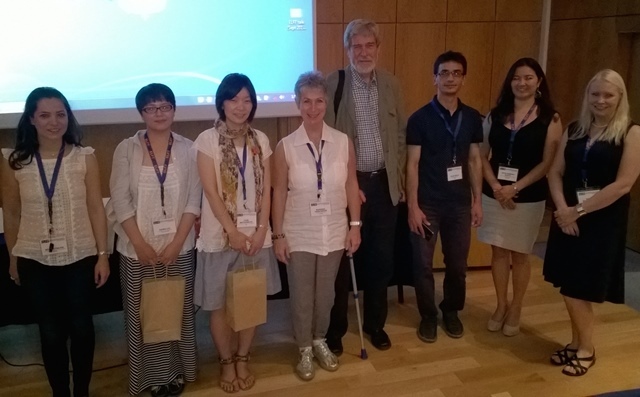 From left: Roxani Faltzi, Haibo Liu, Yumi Matsumoto, convenors Barbara Seidlhofer and Henry Widdowson, Talip Gulle, Miya Komori-Glatz and Kaisa Pietikäinen. For an inexperienced conference-goer such as myself, the prospect of giving two separate presentations under the watchful (and no doubt evaluative) eye of several distinguished ELF veterans made my stomach turn. In spite of my anxiety, I packed my most formal business jacket and flew to Athens for the 7th International Conference of English as a Lingua Franca, better known as ELF7, hosted by DEREE, The American College of Greece, during 4–6 September. By the end of the first fully-packed ELF day, my anxiety had levelled, and I was able to present my first talk rather successfully, or at least the small, heat-exhausted audience seemed quite interested in the topic: misunderstandings in private conversations among ELF couples, and how miscommunication was skilfully pre-empted by using various comprehension-enhancing tactics. I will post about this study later in more detail. Nottingham Castle, the site of the conference excursion dinner. Last month I presented a paper at the ICAME 35 corpus linguistics conference at the University of Nottingham, and I was happy to find that I wasn’t the only one there combining an ELF research perspective with a corpus methodology. Two other major ELF corpus projects were also represented at the conference, and it was nice to hear about the different research questions and ELF data that are being investigated. Though ELF research is still seen as controversial in some quarters, our papers and poster seemed to be well-received. Other researchers can see that lingua franca data is linguistically relevant and can be fruitfully investigated without foregrounding ideological concerns. My own paper was drawn from my PhD research, a corpus-based study of fluency in spoken academic ELF. This data is drawn from ELFA corpus and SELF project data, all of which is naturally occurring spoken ELF from university settings. In addition to this data from relatively formal settings, a new corpus of informal academic ELF talk is being compiled at the University of Saarland. In their paper at ICAME 35, Stefan Diemer, Marie-Louise Brunner & Selina Schmidt shared early findings from CASE (Corpus of Academic Spoken English), made up of recorded interactions on Skype. But first, I want to discuss a project from Linnaeus University in Sweden, where an ELF research perspective is integrated into a corpus-based study of ongoing change in English. Click to view the poster presented by Mikko Laitinen, Magnus Levin & Alexander Lakaw at ICAME 35, 30 April–4 May, 2014.